A look at the writings and the connections of Yash Ghai, the newly-appointed chair of the Constitution Commission, reveal he's already pretty thick with the regime. The Kenyan born academic has been closely associated with the Citizens Constitutional Forum, supervised the controversial thesis of the illegal attorney Aiyaz Sayed Khaiyum which recommended the dismantling of key Fijian institutions, and met Frank Bainimarama after the 2000 Speight coup for “legal consultations”. In 2004, Ghai disclosed his meeting with Bainimarama as follows: “When I was in Fiji in October 2000, the Head of the Armed Forces invited me for consultations, particularly in view of the impending Court of Appeal decision on the legality of the coup. All senior officers were carrying copies of the Constitution. During our conversation, I was told that the Army had only begun to study it, and, to their surprise, found it was an excellent constitution and a better one could not be imagined. 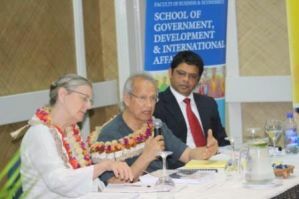 Readers may also recall that last month Ghai surfaced in Fiji to launch his handbook on “Constitution making and reform: options for the process”. The book was officially launched by former vice-president, Ratu Joni Madraiwiwi (a CCF member), at the CCF headquarters in Suva. Among the guests was Yash Ghai’s former student, Khaiyum, who sat next to the Kenyan and his wife Jill Cottrell, one of the co-authors of the handbook. C4/5 understands the book launch was a carefully choreographed exercise to pave the way for Ghai to turn his constitution making “handbook” into a “cookbook” on behalf of the illegal regime. The CCF CEO Akuila Yabaki’s statements that welcomed Ghai’s appointment as chair of the Constitution can be seen as nothing but a charade to hide CCF’s own complicity in the drawing up of a new illegal constitution. As we can see below, (see earlier Constitution story on CCF and Jenny Hayward-Jones), Yabaki is trotting out some of the issues raised by Ghai; note his recent statement that decisions have to be made about the role of the Great Council of Chiefs plus land ownership. So what are Yash Ghai’s views on the 1997 Constitution and other related issues in Fiji? We direct our readers to the following chapter Between Coups: Constitution Making in Fiji, Ghai and his wife wrote for a book titled, Framing the State in Times of Transistion: Case Studies in Constitution Making. "Some commentators have concluded that the Constitution was fundamentally flawed because it permitted the emergence of an Indo-Fijian Prime Minister and this was unacceptable to the Fijian community. We find this a simplistic analysis. It is true that this Prime Minister was perhaps particularly hard for the other community to swallow. But it is also true that the result of the 1999 election made it much easier for those sections of society that really did not want any change in the constitutionally sanctioned reinforcement of Fijian paramountcy – meaning the paramountcy of a particular class and a particular structure for society – to portray the entire constitutional settlement as a disaster for Fijians. It was easier for this to be done because so few people really understood the document. "How much could have been done by way of public education within the timeframe is not clear. But we have shown that the process was far less transparent and participatory than it might have been, and we have also tried to show why this was so. The experience of other countries has shown that in the final analysis what matters may be more the views of community leaders than the participation of the people themselves. And though Rabuka and Reddy may have tried to lead in one direction, other leaders were marching determinedly in another. "The content of the constitution itself may share some of the blame. The electoral system that hardly anyone understood was responsible to some extent for the 1999 election result. The power sharing arrangement that is technically clumsy and politically unworkable with the current players gives the current government a good reason for pressing for constitutional amendment. And we have noted the awkward marrying of the liberal and the consociational that retained many ambiguities of the past. "A constitution is not established in a vacuum. In order for a new and just constitutional system to take root in Fiji, a great deal of damage from the past must be undone. Much of that damage can be traced to the colonial experience, other elements to the post-1987 period. The Reeves Commission aimed for a radical restructuring of the values and institutions of the state. Although the people may have been ready for fundamental change, politicians clearly were not. Experience shows that if politicians, who have a special purchase on state institutions, are not committed to a constitution, its prospects remain dim. "In trying to please many groups, the thrust of the constitution was blunted. One critical factor, for example, was the reversal of the Reeves Commission’s proportion between racial and non-racial seats, with the result that ethnic politics remained dominant. "Constitutions that aim for a fundamental change need much more caring and nourishing than this one got. Had its principal proponents, Rabuka and Reddy, won the elections, more concerted efforts might have been made to observe its spirit and implement its provisions. Certainly, little was done to prepare the public, in terms of information and persuasion, for the new constitution and the radical changes it was intended to promote. "The new constitution remained hostage to contingencies it could not control: the election of a prime minister who had little respect for the aspirations and conciliatory procedures embodied in the new constitution, an unsuccessful businessman cut off from the largess of the state with the change of government who capitalized on ethnic fears, and the easing of external pressures on constitutionalism all contributed negatively to the fortunes of the constitution. "However, the constitution survives and there remains considerable support for it among sections of the people. The vision of Fiji on which the constitution rests still has its admirers. It is too early to write it off." Yash Ghai is now prepared to write off the 1997 Constitution at the bidding of his former student Aiyaz Sayed Khaiyum and the puppet dictator Frank Bainimarama. The question that needs to be asked is this: How much of Fiji taxpayer’s money is Ghai being paid to rip apart the 1997 Constitution? Yash , educated illiterate, foolishman!!!!!!!! Let them write up the Constitution, then another stupid soldier will just do another coup. By the way, are the Chinese providing any funds for the election , like the Australians. Or don't the Chinese believe in Democracy? Ghai Bicai how much you charging to destroy 1997 constitution. as was said before the constitution has already been formulated by Shameem and Kaiyum...the addition of Ghai is to add legitimacy to their constitution...all these public consultation talks are for window dressing. I would like to see Qarase and Wardan Narsey together in next government. They'll deliver the best to the people of Fiji. Bainimara will stand for elections. That is the reason Khaiyum slipped in as the Minister for Elections, so that he can make sure Bainimarama will win the election, even if he gets only few votes. Later, in the not too distant future, Bainimarama will slide himself into the shoes of the President of Fiji and the now Acting PM will become the PM. You ghais should be ashamed of yourselves attacking a man of this calibre. Whatever you think of him, he's acknowledged as a world authority on formulating constitutions. Seems these attacks are part of the usual racism on 4.5. Why else would anyone call him Professor Ghee? Ok, he's a Kenyan born citizen of Indian descent. And I'm a bloody Tuvaluan. So what? Play the argument and not the man. Fiji is lucky to have him. There is an absolute conflict of interest with this coup apologist professor. The whole process is a sham. How much money is this professor making from supporting the junta and exploiting the people of Fiji? How legitimate is it for people to have a sham constitution imposed on them at the point of a gun? 1997 const is a live..
the rest is illegal like the regime. we dont need another const or bs decree of ag taliban/frank the crank. @ 6.34pm..Go back to Tuvalu and get sinking and bloody take that Ghai..Ghai with you..We fijians dont need him to write up or to do anything with our constitution..as far as we are concerned its a waste of taxpayers money and its going to flop out like the failed charter..Its another John Sami character trying to make extra money out of thieves..As far as we are concerned the last constitution still stands and if they ever try to write up a new one ..we will tear it down again in the future..
Its all for money, John Sami came and gone, John Prasad next now Ghai's turn. That the 1997 Constitution is legal and Bainimarama's regime illegal should be the touchstones for opening any discussion of Fiji's constitution. The 1997 Constituion is flawed. The electoral system does need to be changed. The power sharing arrangement was awkward and worse. But the 1997 Constitution is legal and better in many respects than the People's Charter, with some version of which the regime seeks to replace it. Yash Ghai notes that the lack of transparency and public participation were debilitating factors with respect to the constitution's acceptance. Well, if the constitutional process planned by the regime is anything like the People's Charter process, then the new constitution will be dead on arrival. For all of the pretense at public hearings, the People's Charter was imposed on Fiji. In fact, the regime didn't accept a single comment, and so the Charter wasn't changed one scintilla from the original draft before being sent up to President Iloilo for his signature. Ghai says the constitution was hostage to many contingencies but failed to list among them the biggest problem of all: an oversized, rogue military that doesn't respect the principle of civilian supremacy. So how does the learned Professor reconcile his task of writing up a new constitution while a fundamental legal travesty stares him in the face? Yash Ghai, Yes qai, drau, qai..qai...qai..sara. Can someone suggest some names to replace Ghais with regards to writing up another consitution? If I was from Tuvalu I would be more concerned with my sinking 8 islands rather than poking my nose in thi Fijian business-you have a free of speech-we do not want to hear it..
TO ALL OF YOU THE RATUs, ROs. ROKOs, TUIs, SAUTURAGAs, VUNIVALUS, TURAGAS AND ADIs OF FIJI, PLEASE REMOVE THAT TITLE FROM YOUR NAME SINCE YOU HAVE NO MORE POWERS AND AUTHORITIES OVER YOUR SUBJECTS NOW. NO MORE TURAGA NI YAVUSA OR TURAGA NI MATAQALI SINCE YOU HAVE NO MORE TITLE AND NO MORE LANDS WITH YOUR SUBJECTS LEFT BECAUSE IT IS NOW BELONGS TO FIJIAN NOT ITAUKEI. WE ARE ALL EQUAL. TO YOU THE CAKOBAUS, MARAS, GANILAUS, SUKUNA, MADRAIWIWI, DOVI, VUIYASWAS, LALABALAVUS, MATAITINIS,TOGANIVALUS,NAGAGAVOKAS AND MANY OTHER CHIEFS SHOULD BE RESPONSIBLE FOR THESE DISESTABLISHMENT OF THE GREAT COUNCIL OF CHIEFS BECAUSE OF YOUR IRRESPONSIBILITY AND FAILURES TO PROTECT YOUR COUNTRY, SUBJECTS AND RELIGION IN THE FIRST PLACE WHEN IN LEADERSHIP BUT DRUNKARD AND WOMANIZING WERE THE ONE YOU SERVED AND PAID THEM WELL. ONE QUESTION TO ALL OF YOU CHIEFS; WHERE THE KAMUNAGAS NI QALOQALOVI. ITATAU, IVAKASOBU ACCOMPANIED WITH YOUR PROMISES, "DUA VATA TIKO MADA NA KEDA IWAU, DEI TIKO MAD GA NA ITIKOTIKO VAKATURAGA KA NODA I LIULIU TIKO GA KA TAWA MUDU NA KARISTO KEI NA NODA KALOU BULA, MANA EEEIII DINA" CHIEFS, SIR, IT IS OVER BECAUSE RATU VOREQE NA TURAGA NA TUI KIUVA IS THE MOST HIGH AND ONLY PARAMOUNT CHIEF OF FIJI AND DOING A GOOD JOB. NO MORE RATUS AND ADIS. KISS THE LAND AND SAY GOOD BYE TO YOUR LANDS, VANUA AND LOTU. NEXT TO GO IS THE ITAUKEI LANDS TRUST BORD BECAUSE WE ARE ALL EQUAL. Anonymous 2:44, Yash Ghai shouldn't be drafting Fiji's constitution, Fijians should -- Fijians freely elected from among the people for their integrity, wisdom, and prudence. Bainimarama won't allow that. Instead, he's putting together an illegal and illegitimate process, using Yash Ghai as window-dressing, while Nazhat and Aiyaz do the real drafting, based on the so-called People's Charter shoved down everyone's throat. Far from ending coup culture, the People's Charter is designed to perpetuate military rule by giving the RFMF an ongoing political role as Fiji's ultimate judge, guardian and arbiter. It also would give Fiji's compromised courts the authority to disband political parties deemed inconsistent with the 'spirit' of the Charter. The regime will soon require political parties to re-register. Then we'll see a repeat of the farce we saw when Bainimarama dis-invited the SDL and NFP from the Leaders of Political Parties process because they had refused on principle to accept the People's Charter as a prerequisite for participating in the bogus dialogue. It remains to be seen whether Yash Ghai will allow himself to be used as a 'Yes Guy' in the process underway. But his agreement to participate in such a pre-orchestrated process and his silence while Bainimarama moves against the constitutionally sanctioned GCC are not encouraging signs.